Yokoi served with the 29th Infantry Division in Manchukuo. In 1943, he was transferred to the 38th Regiment in the Mariana Islands and arrived on Guam in February 1943. 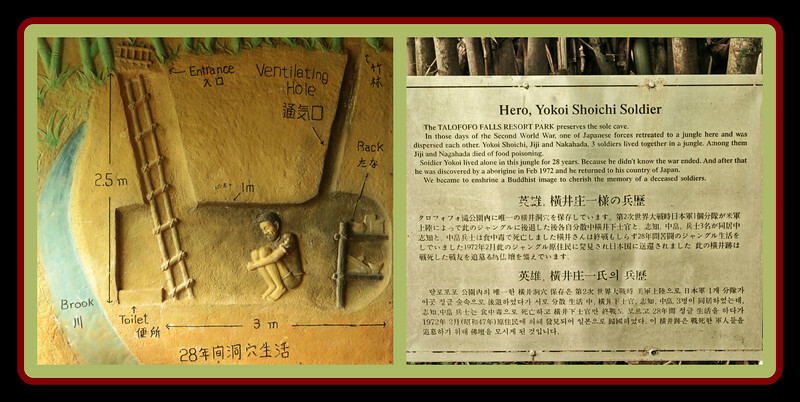 When American forces captured the island in the 1944 Battle of Guam, Yokoi went into hiding with nine other Japanese soldiers. Seven of the original ten eventually moved away and only three remained in the region. These men separated but visited each other until about 1964, when the other two died in a flood.. The last eight years Yokoi lived alone. Yokoi survived by hunting, primarily at night. He used native plants to make clothes, bedding, and storage implements, which he carefully hid in his cave. Wonderful presentation and tribute, this is such an interesting story. How interesting! I had heard about this but didn't realize it was on Guam. What a great story. Nice find and super capture. Great reminder of fortitude & ingenuity.